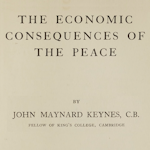 Paper proposals are invited for a conference to celebrate the 100th anniversary of the publication of J. M. Keynes's The Economic Consequences of the Peace. The "Economic Consequences of the Peace Centenary Conference" will take place on 9th-10th September 2019, at King's College, Cambridge. Dr. Toke Aidt in collaboration with colleagues at the Université libre de Bruxelles wins British Academy/ Leverhulme grant to study democratic purges in post-World War II France.